Performers include: John Goodman, Laurie Metcalf, Sara Gilbert, Lecy Goranson, Michael Fishman, Emma Kenney, Ames McNamara, Jayden Rey, Maya Lynne Robinson, Estelle Parsons, James Pickens Jr., and Natalie West. When ABC revived Roseanne for a 10th installment, the sitcom earned stellar Nielsen ratings, averaging a 3.49 in the 18-49 demo with 13.482 million viewers. During the 2017-18 television season, it dwarfed the performances of both Grey’s Anatomy and Dancing with the Stars, and was quickly renewed for an 11th season. However, once star Roseanne Barr made offensive statements on Twitter, the network cancelled Roseanne. Still, it was not ready to give up on the rest of the cast, the Conner family’s story, or a shot an Nielsen gold, and thus The Conners TV show was born. 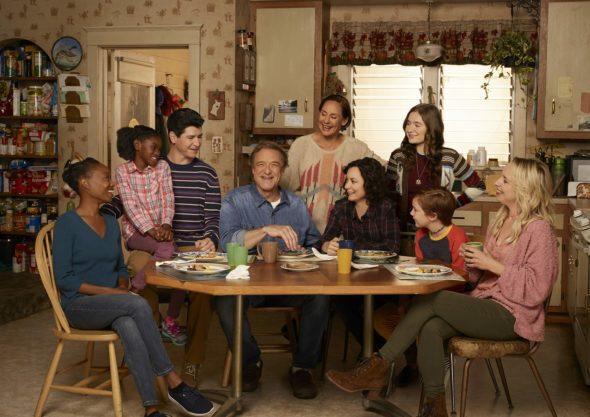 Like Roseanne before it, The Conners follows the story of working-class family of Roseanne and Dan Conner (John Goodman) including their three children Becky (Lecy Goranson), Darlene (Sara Gilbert), and David Jacob ‘D.J.’ (Michael Fishman), as well as Roseanne’s sister, Jackie Harris (Laurie Metcalf). The spin-off kicks off after a sudden turn of events results in the working-class Lanford, Illinois family facing life’s ups and down without its matriarch. As in the original family comedy, Dan, Jackie, Darlene, Becky, and D.J. grapple with the stuff of everyday living, from relationships, to pregnancy and parenthood, financial challenges, and more. No matter what challenges they must meet, the Conners endure, thanks to their persistence, humor, and most of all — love. What do you think? Do you like The Conners TV series? Should this ABC TV show be cancelled or renewed for another season? The show should be renewed! I find it very funny! Roseanne’s support of Trump was very offputting! Please renew!!! This show should be cancelled. Its not funny without Roseanne. I stopped watching it. She made a comment that the network executives thought was inappropriate or not politically correct, she apologized, they still fired her and they shot themselves in the foot because the show stinks now. Cancel it. This was Roseanne’s baby, and it isn’t funny with out her, and should not have been allowed to continue. I work in long term care, so it is sometimes on in my patient’s rooms. I don’t know anyone who turns it on intentionally. If someone falls asllep and the TV was on, I’ll see it as I go from room to room. Sad..